Join us for special events to make the season bright! Join us for our favorite holiday desserts prepared by our culinary team. Our distinctive, independent senior living community features 41 modern apartments with high-end design, flexible dining packages, optional housekeeping services, activities and programs, care coordination, as well as priority consideration to the continuum of care offered by Fairport Baptist Homes.The Woodlands is conveniently located close to Perinton Square Plaza, Wegmans, Eastview Mall and more. Please join us at The Woodlands as we host these events. Join Philip Provenzano, a licensed Medicare Specialist from PMG Financial Group, who will present information about health plan benefits from our local health carriers and help you choose the correct coverage. Refreshments will be served. Learn how to protect yourself online with topics including privacy tips, email scams and username and password safety. Refreshments will be served. Join us and our Woodlands chef to sample a variety of Thanksgiving specialties. Learn the basic features and benefits of the iPhone including how to use the various functions and Apps. living community and enjoy a tasting from our restaurant. Join us to learn more about our brand-new independent living community and take a tour. Refreshments will be served. by Phillip Provenzano from PMG. Learn the basics about Medicare-available programs, changes to plans and the enrolling process. A light breakfast will be served. Join us to celebrate the fall season with a wine tasting from Raymor Estate Cellars, live entertainment, and tours of our community! Appetizers will be served. Please join us at The Woodlands as we host these informative and interactive sessions from experts in the field. Learn valuable tips for sorting, decluttering and preparing for a move. A light breakfast will be served. by Amanda Champlin from Champlin & Associates. Learn how to preserve and protect your assets over multiple generations. A light lunch will be served. by Nancy Carr from Preserve a Photo. Learn how to get started organizing, sharing and preserving your memories. A light lunch will be served. While you’re here, take a tour of our new, independent senior living community and enjoy a tasting from our restaurant. 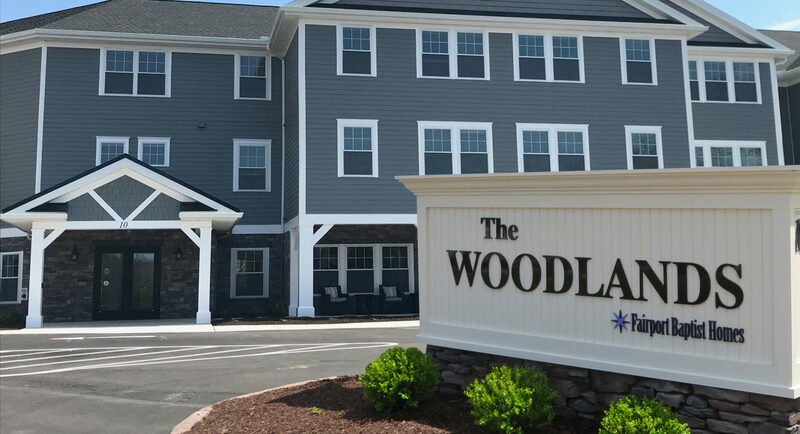 Learn more about our brand-new independent senior living community, take a tour and enjoy a tasting from our Woodlands restaurant. Our distinctive, independent living community features 41 modern apartments with high-end design, flexible dining packages, optional housekeeping services, cultural programs, care coordination from our SOFI (Senior Options for Independence) team, as well as priority consideration to the continuum of care offered by Fairport Baptist Homes. The Woodlands is conveniently located within the StoneBrook Community, close to Perinton Square Plaza, Wegmans, Eastview Mall and more. Apartments are now being rented on a first-come, first-served basis.